Ask anyone to name something typical of Japan, and it is highly likely that they will say ‘sushi’. After my return to Belgium, I have often been asked if Japanese people really eat sushi every day. The answer is no! Japanese cuisine is incredibly varied and there is so much more to it than just sushi. So it seems that the moment has finally come. It is time for a post about sushi. 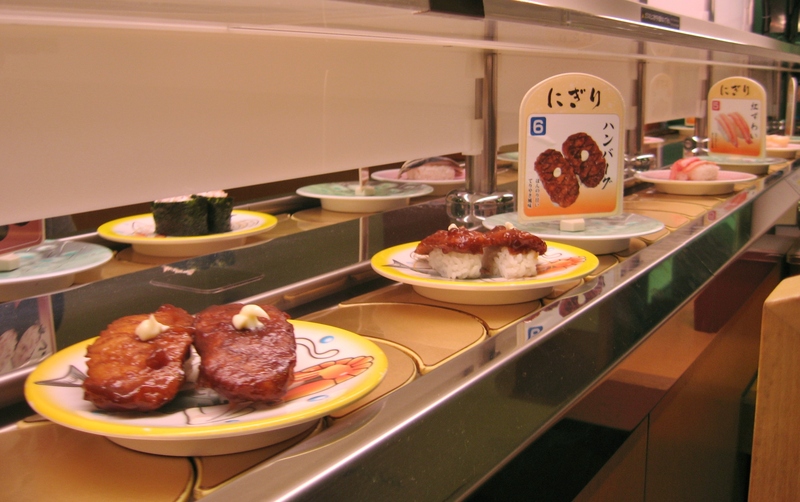 In Japan, sushi is often enjoyed at a restaurant, rather than at home. There are many different kinds of sushi restaurants, ranging from extremely high-end places where the chef personally prepares each delicacy in front of you, to the more moderately priced conveyor belt restaurants (kaiten zushi 回転寿司 in Japanese). Even in the conveyor belt category, there are different prices and qualities. Today I will talk to you about the lowest of the lowest: Kappa Zushi. Although this is not a great introduction for a restaurant, I assure you that compared to most European (or at least Belgian) sushi restaurants, the quality is still very good. 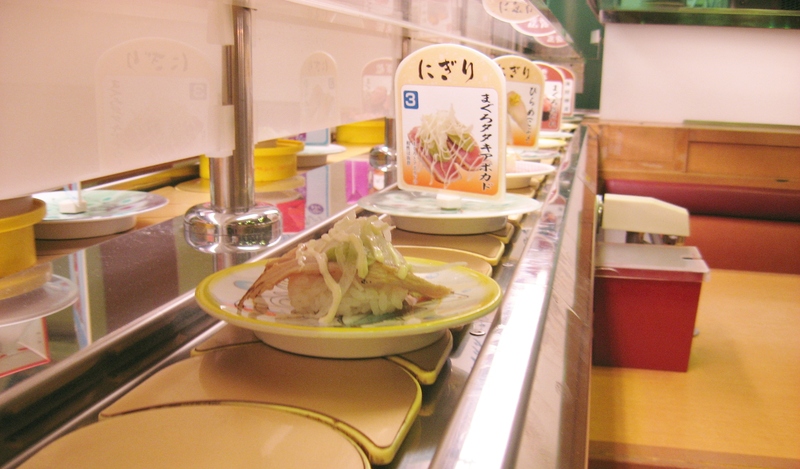 At conveyor belt restaurants, the kitchen prepares a standard selection of different sushi dishes and places them on the conveyor belt. The sushi passes by all the tables and the customers take off whatever they want to eat. Usually the colour of the plate determines how much the sushi costs but at Kappa Zushi, all the sushi costs 105 yen per plate (about 1 euro at the time we were in Japan). 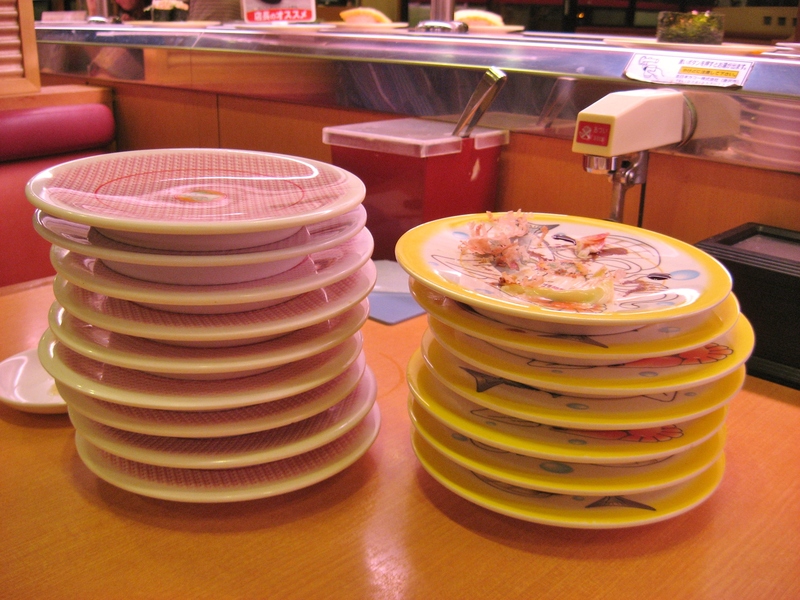 At the end of the meal, the plates are counted to determine the price to be paid. 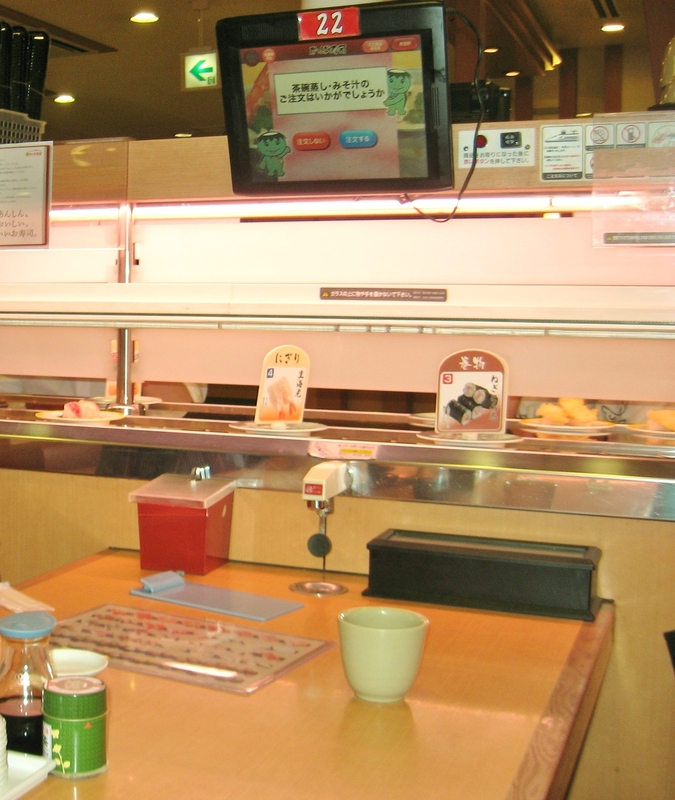 In case you don’t find what you are looking for on the conveyor belt, you can also order directly from the kitchen (for the full Kappa Zushi menu, click here – click on each category to see more sushi). Kappa Zushi has a computerized system for those orders. You operate it with a touch screen above your table. Not an easy thing to do if you can’t read kanji. There is one button that summons a waitress. I am afraid we accidentally summoned the poor lady twice before we figured it out. But if you press enough buttons, you will eventually end up in the orders menu. Kappa Zushi orders menu. 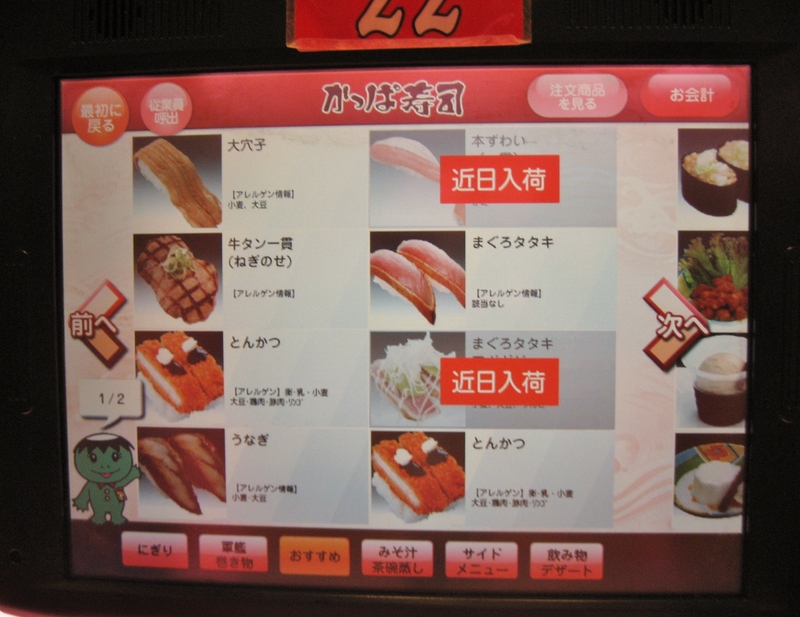 You might notice some unusual sushi like tonkatsu sushi (fried pork cutlet) and beef sushi. You will definitely not find any meat sushi in a high-end sushi restaurant. Another special sushi: hamburger sushi. I guess you can pretty much slap anything onto a piece of rice and call it sushi. Now comes the best part: the orders are delivered on a special sushi train! It is shaped like a shinkansen and swishes over to your table in no time. You take off the plates and the train goes back to the kitchen. Never mind sushi quality, that train in itself is a reason to visit Kappa Zushi! Something else that I love about Japanese conveyor belt sushi restaurants, apart from all the sushi, is the table side tap of hot water. You get a cup, a tin of green tea powder (different from matcha) and you serve yourself from the tap at your table. All you can drink green tea and an endless stream of sushi passing by under your very nose… pure bliss! Tea can in the bottom left, cup in the middle, and the tap is below the conveyor belt, next to the red box with pickled ginger. The black box holds the chopsticks. Each table also has their own supply of soy sauce and wasabi. 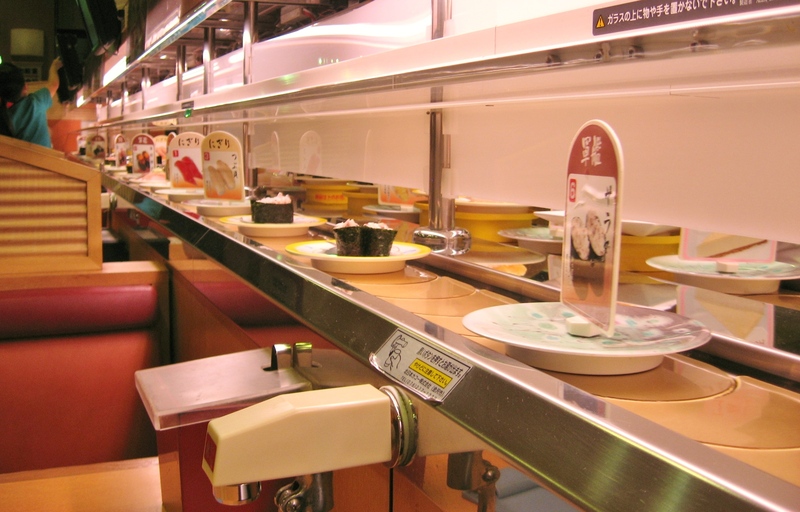 This entry was posted in Japan, Restaurant reviews and tagged Conveyor belt sushi, Fish and seafood, food, Food and drinks, Impressions of daily life, Japanese culture, Japanese food, Kaiten zushi, Kappa Zushi, Restaurant, Sushi, sushi restaurant, sushi restaurants, Toyota City, Train by Haruko-chan. Bookmark the permalink. I’m not the biggest sushi fan, but I would love to try it in Japan with a sushi train delivering it! 🙂 Great post and you did a great job clarifying that sushi is not a daily staple in Japan. Our favourite sushi place in Toyota was one block away from Toyota City Sky Hall. But I will write about that in another post. I’ve only been to Kappa Zushi once, and it was five years ago, but it’s one of the most memorable sushi experiences I’ve ever had. The hamburger sushi and Shinkansen stick out in my memory most. When my friends were visiting I wanted to take them to a place like this to show them the gimicky side of sushi (compared to the usual ritzy style of an American sushi bar), but I was a little disappointed when we wound up at a little conveyor belt sushi place frequented by salarymen men instead. Still tasty and still a good experience, and it did have the same green tea set up, but no Shinkansen. Thanks, I’m glad you liked it 🙂 The sushi train is the best! We have many conveyor belt sushi restaurants in Southern California but none of them have the individual hot water dispensers. I love those! The first time I tried to use them, I made a bit of a mess. You should press the cup horizontally against the black button under the tap but you have to press quite hard before any water comes out. It took a bit of getting used to.